I’m embarrassed to confess that I’ve owned my KitchenAid for almost a year without touching it. When Steve and I got married, my domestic wife instincts kicked in, and I just had to buy the KitchenAid Artisan Series 5-Quart Stand Mixer in Onyx Black. I mean, look at it! It’s sleek and beautiful and promises a lifetime of joy in the kitchen. Men have their pretty cars, women have their KitchenAids. Anyway, we bought it, brought it home with us, and promptly set it on a shelf where it began to collect months of dust. And every day I would pass it by, guilt piling up in an ugly heap in my heart until I couldn’t even look at it in the face. Until last night. Last night, I had the urge to bake (which is a rare occurrence for an Asian housewife…baking isn’t the most Asian activity) chocolate chip cookies. I think the urge came from watching the Friends episode where Monica is trying to figure out Phoebe’s deceased grandmother’s secret recipe for chocolate chip cookies. 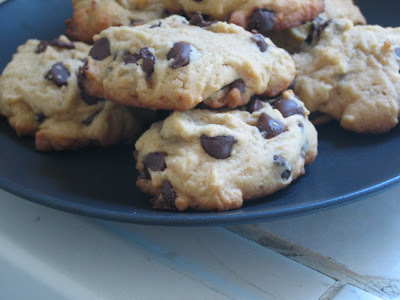 I found this recipe for Soft Chocolate Chip Cookies here on allrecipes.com, and can take absolutely no credit for it whatsoever. It got over 3,000 great reviews, so I figured it couldn’t be that bad. One day when I’m the World’s Greatest Mom, I’ll perfect my own original recipe. I wiped the dust of the KitchenAid, and went to town with it. It was so simple and fun to use, I venture to say that baking might become more frequent in our house (we’ll see about that one). Although I was so distracted with trying to work the KitchenAid for the first time, I accidentally used baking power instead of baking soda. Whoops. Even with my mistake, the result was a house filled with a wonderful aroma, and a batch of the most delightfully soft cookies ever. Try it out yourselves! There was a lot of cookie dough, so I rolled some of it into logs, wrapped them in plastic wrap, and have ready-made dough for later. Preheat oven to 350 degrees F (175 degrees C). Sift together the flour and baking soda, set aside. In a large bowl, cream together the butter, brown sugar, and white sugar. Beat in the instant pudding mix until blended. Stir in the eggs and vanilla. Blend in the flour mixture. Finally, stir in the chocolate chips and nuts. Drop cookies by rounded spoonfuls onto un-greased cookie sheets. Bake for 10 to 12 minutes in the preheated oven. Edges should be golden brown. Who Let That Chick Get a License? Cool cookies! I will try those sometime soon. I was also baking today. I tried a flax whole wheat bread. Pretty good. HA! See? The mindset is totally affecting you, too! Not an Asian thing to do…tsk tsk. I will blog further about this whole thing but I think it’s mainly annoying as I haven’t found a way to shake it. *drools* Kitchen Aid Artisan Series 5-Quart Stand Mixers in Onyx Black aren’t just for girls. Serious. Uhm…. pardon my slobber. EXCUSE ME, Mr. Marks, but I thought this was a food blog.Interracial marriages create nothing but heartache for any children conceived by such a union.DID you not read the media headlines today about the strife wrought by interracial marriages in America?Perhaps you two should stick to “baking” cookies instead of “making” interracial children. Hmm, not sure what’s going on with the previous comment, but in any case that’s one of my favorite cookie recipes! I’m an Asian baker!I know what you mean, though. My Mom NEVER baked growing up so I somehow sprouted this love of baking all on my own. found your blog via tastespotting. i’m an asian amateur baker myself. those cookies look awesome. i never thought about using vanilla pudding mix! Gorgeous photo, WOW you’re good at that! Popped my eyes wide open.That comment up there is just … holy crap, I’m speechless. I was shocked, so i looked at the person’s profile to see if maybe this was some kind of joke… I guess it might be, the profile is obviously some kind of fiction. Still, your lovely domain would be well rid of that comment, imho. Catherine – I agree…it looks like a fictional person.chiff0nade – if you ARE real, I’m sorry to know that people still have views like that. 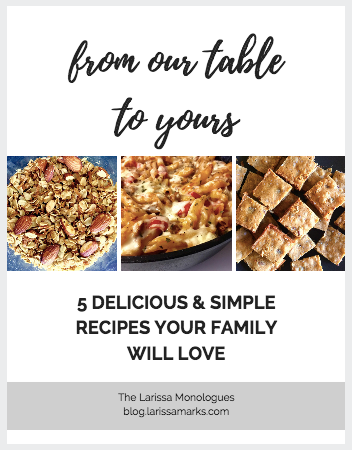 Larissa, Thank you for the recipe. They Just came out of the oven and they’re delicious! That comment was not made by the real poster who goes by Chiffonade.It was made by Charles Treuter, of Columbia Maryland. A pathetic internet troll.He generally posts as “DocChuck” but has been using the name of a woman he is stalking (“chiff0nade”) to make disturbing posts — often of a racist or sexually deviant nature — he thinks people will attribute to her.He is also the “Tastespotting Stalker.”But they don’t.So the joke is on him yet again. Yes siree, Bob, I have created a great blog site that provides a very thorough and meticulous exposé of DocChuck/Charles Richard Treuter. Additionally, I think I can promise you that there will be many more revelations to come about this Internet troll who dubbs himself as DocChuck and many other handles. DocChuck/Charles Richard Treuter is a pathological liar and the blog arms those who read it with the truth needed to confront the moonbat. Although it’s been a commissioned assignment to expose Charles Richard Treuter (http://www.myspace.com/docchuck) of 5633 Columbia Rd. – Apt. 102, Columbia, Maryland, 21044, Phone Number: (A.C. 410)245-4750, it may very well serve many others (in addition to the individual who commissioned The_Ferret to gather together an investigative file on the person/blogger in question) who have, for varied reasons, also wanted to know the true identity of the vile and menacing “DocChuck”. Well, it's time (actually past the time) to properly and thoroughly unmask and expose DocChuck/Charles Richard Treuter and Mrs.DocChuck/Elizabeth Ann (Jarvis) Treuter and it's been done. I mean IT HAS BEEN DONE. Both sites are quite enlightening and great reads – ENJOY!